Chase and Jamie Dimon kept that rep for a good long time. As late as 2011, Dimon’s name was being floated around Washington very seriously as a potential replacement for Tim Geithner’s Treasury Secretary post. 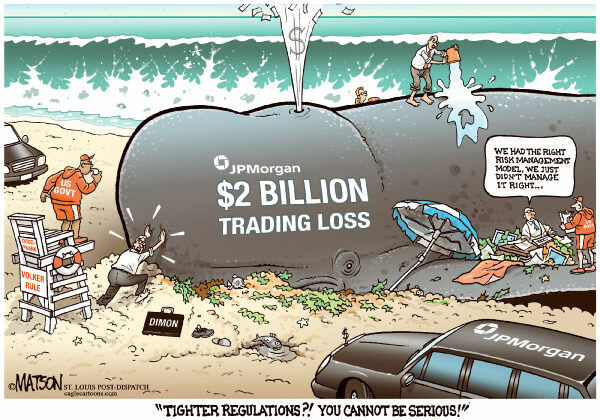 Even when Dimon showed up on the Hill last year to testify (read: obfuscate) about the infamous “London Whale” episode, Senators on the banking committee – who, as writer George Zornick noted, had collected a cumulative $522,088 in donations from Chase – slobbered all over Dimon and shelved the important London Whale matter to ask the great genius’s advice on how to fix the economy. Well, there’s some more news about the “good bank” – Chase is about to pay yet another ginormous settlement for cheating and stealing from the public. According to the Wall Street Journal, the Federal Energy Regulatory Commission (FERC) will fine Chase “close to $1 billion” for manipulating energy prices in Enron-esque fashion in Michigan and California. The story is interesting in itself – and we’ll write more about it later – but for now, it’s just the fact of yet another massive settlement for this bank that’s so interesting. 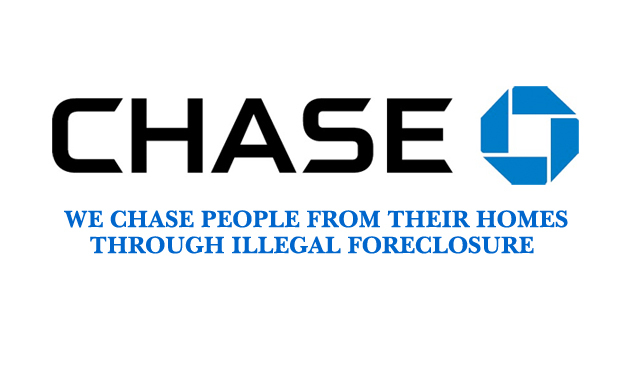 • Last year, Chase paid a $45 million settlement to the federal government for improperly racking up fees for veterans in mortgage refinancings. Hey, if you’re going to steal from everyone, you can’t leave out those veterans overseas! • The bank last year was convicted in Europe along with several other banks for fraudulent sales of derivatives to the city of Milan. A total of about $120 million was seized from Chase and three other banks. There have been so many settlements with so many agencies around the world (I’m in a hurry and can’t get to Chase’s messes in Britain, Japan and elsewhere) that they’re almost impossible to count. Some papers are reporting that Chase is being investigated by as many as eight different agencies in the U.S. alone. There are some other civil actions left out, too, like the $110 million class-action settlement for improper charging of overdraft fees, or their part in the gigantic $6 billion settlement completed last year involving Visa, MasterCard and other credit card providers for manipulating card service rates. And states like California have only just begun crawling up Chase’s backside for its role in the lunatic filing of erroneous credit card collection lawsuits, a scam outed by whistleblower Linda Almonte. 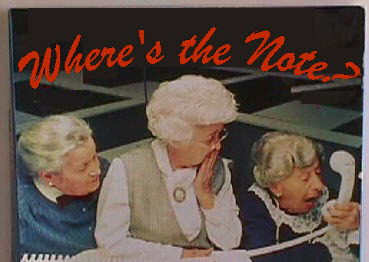 Chase is turning into the Zelig of the corruption era. 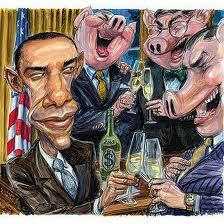 In virtually every corruption scandal, the bank is in the background somewhere. The HSBC money-laundering mess? Chase was reprimanded for similar abuses. The Madoff story? They’re under investigation there. MF Global? As banker to Jon Corzine’s notorious firm, they were part of a $546 million settlement to return money to MF Global’s outraged customers. Jefferson County? That was them. And again, you might have heard of Abacus, but Magnetar was just as bad. Not that anyone’s counting or anything. Memo to colleagues on the White House pool: could someone please ask the president if Jamie Dimon is still his favorite banker? Thank you again, Matt Taibbi. Outstanding article! This entry was posted in Uncategorized and tagged Abacus, BANKSTER, CFTC, Chase, derivatives, economy, Federal Energy Regulatory Commission, George Zornick, Goldman, HSBC, J.P. Morgan Chase, Jamie Dimon, Jon Corzine, Josh Rosner, Lehman Brothers, London Whale, Madoff, Magnetar, Matt Taibbi, MF Global, Milan, money laundering, mortgage, New York Times, OCC, politics, robosigning, Rolling Stone, Tim Geithner, Where's the Note? by Deadly Clear. Bookmark the permalink. 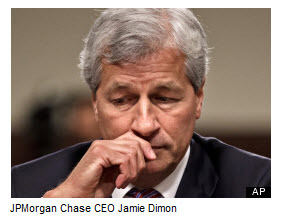 Is Dimon still the President’s favorite bankster? Does mice bark? The President has his own opinion about Jamie Dimon but that is the President’s opinion. The President doesn’t reflect my opinions. Jamie is getting what he deserves. When you do wrong, don’t admit your mistakes, continue to commit the same crimes, and pay your way out of jail, it comes back to bite you. J. Piermont Morgan is rolling over his grave to see what is happening to the company that he created.